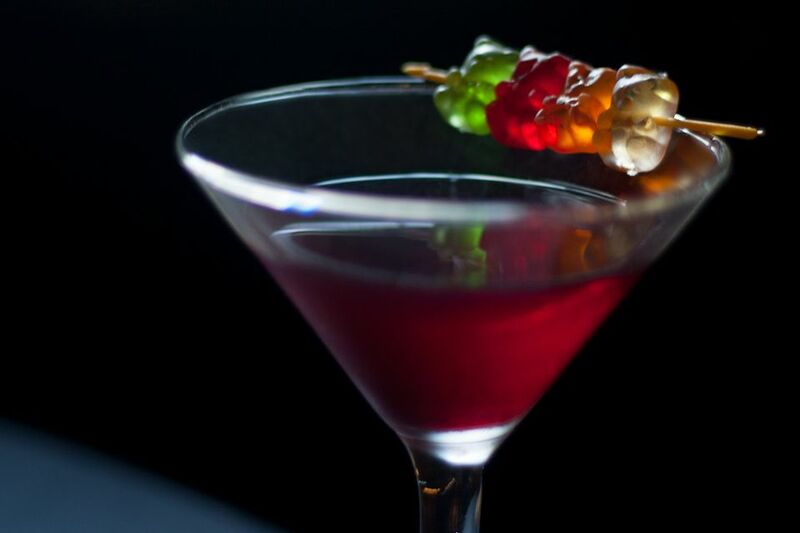 The Gummy Bear Martini is a popular vodka cocktail that is a joy to share with friends, what with its whimsical candy garnish. It is one of those adult beverages that remind us of our childhood and gives us just one more excuse to act like a kid again. This version of the cocktail recipe is very easy and requires just three simple ingredients that are combined to form a fruity blend. It is just sweet enough to forget that there's alcohol in it (Caution: that means it can be easy to have one too many!). You can even make your own raspberry vodka for drinks like this. The infusion takes about one week and is a great way to use raspberries when they are in season. If you don't care to DIY the infusion, there are plenty of brands that make an excellent raspberry vodka. Gummy bear candies come in a variety of flavors and, in the spirit of this cocktail's inspiration, have fun mixing up flavors to create your own version. Try switching to peach vodka and raspberry schnapps, opt for citrus, pineapple or pear vodkas, or throw in a little fresh watermelon or apple juice. As the dozens of Gummy Bear Martini recipes out there prove, there are no rules to this cocktail. Have fun with it and don't forget the gummy bear garnish--the most important part! Garnish with a skewer of gummy bears.